Carlton Rode towermill was very unusual in that it was one of only a very few towermills to have been built with clay lump, the others being at Attleborough and possibly at Besthorpe along with Besthorpe Black Carr postmill that had a clay lump roundhouse. The puddled clay lump structure was surrounded with a tarred brick outer shell with a series of iron hoops holding the 50-55 foot, five storey tower together. The total wall thickness was reported to be 1'6" to 2'. However Rex Wailes stated that the clay was 27 inches thick and the brick was a further 9 inches. The mill was built with common sails that were later changed to two pairs of patent sails, one pair had 8 bays of 3 shutters and the other pair had 7 bays of 3 shutters with the outermost bay having 2 shutters. The boat shaped cap had a petticoat and held a gallery and an 8 bladed fan with a cradle beneath the fanstage. The sails powered two pairs of overdriven stones with an additional pair being driven by an engine via a shaft through the tower wall. The canvas of the original common sails was replaced by Zeppelin doped canvas after World War I by Tom Riches of Banham composite mill. Weather beam once so eaten away by rats that it had to be replaced. New elm brake wheel made by Bristowe & Olly of Stalham. Stones overdriven in circular vats. Governers. Indirect drive from upright shaft via a countershaft. Thomas Martin who was miller in 1864-65, went on to be the miller at Station Road towermill Attleborough in 1867, which was one of the other few mills to have been built of clay lump. Salter & Simpson are favoured with instructions from the Mortgagee to Sell by Auction at the Royal Hotel, Attleborough On Thursday August 12, 1880 At 5 for 5 o'c in One Lot. The following desirable Freeehold PROPERTY comprising SEVEN TENEMENTS with Outbuildings & Gardens adjoining, in the occupation of Robert & Edward Muskett & others. Also an excellent Brick Tower WINDMILL driving two pairs of stones, together with an Inclosure of fine Arable LAND containing in all 4a. 2r. 13p., situate on the high road from Attleborough to Bunwell, in the occupation of Mr. Charles Burroughes. Particulars of Messrs. Wilkinson & Slann, Solrs. Attleborough & Holt & of the Auctioneers Attleborough. Mrs. R. SMITH, Messrs. T. and E. COOPER, at the Annual Rental of £51/2/6. This Lot will be sold subject to the right to take water from the well on Lot 2, by paying a moiety for keeping such well in repair. Met Mr Fred Lorne 74, who lives next door to the Mill House and in the same terrace. At the time he lived in a different cottage about 100 yards away next to the Farmers Arms Pub. 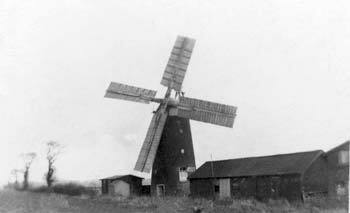 He described the mill, Fantail with a brick plinth about 5'6" high with clay lump above with iron bands round it. Tarred on clay lump. There were 4 sails. The Mill was working up to the War. The walls were tarred and there was a boat top. There were 2 doors, one above the other and windows on the south side. There was a walk way round the cap. Used as a store after. The mill collapsed at 4pm one Saturday about 30 years ago. The bottom band broke and the Clay lump spread immediately above the plinth. The mill had been heard to creak before the collapse. Met Mr R V Ramm today in, Cypress Road, Attleborough, 78 years. He was the miller at Carleton Road from 1920s (with his father) until 1944. The mill was of clay lump with brick on the outside with metal hoops round it. There were three hoops originally but in about 1933 more were added. The brickwork was tarred with gas works tar, and after he sold it in 1944 it was tarred with hot-sprayed tar. Bricked from beginning possibly bricks from Bunwell Brickyard 2-2½ minutes away. The plinth inside was about 2' 6" – 3.0' high and was brick. The walls were between 1'6" – 2.0' thick. The sails were patent and as the sails were a minimum of 15' above ground, it had been built for them. He thought it was built circa 1880 but he may be wrong. It was built by a man called Martin who married a woman 17 years old when he was 70. She was in her 70s in the 1930s. Floor 7' . Top floor 6' to kerb, cap was big. There were two pairs wind driven stones and one pair of engine driven stones. The shaft went through the wall. The lump was rendered inside with no sign of spreader beams under ends of beams. There was no cracking. There were small windows not one above the other. The clay over the Ground Floor door and under the loading door fell out because it was wet. The tower was steady in a wind with no juddering even when there was a pebble between the stones. He and his wife remarked on how warm it was in winter and cool in summer. He did not go and see it after it collapsed. He had seen clay lumps made and remembered a wooden rammer being used in the moulds. Rumour had always said that Martin's son was a very big man and that he 'trod' the clays for the mill. He has photographs as has his son Pat V. Ramm of Caston 396. 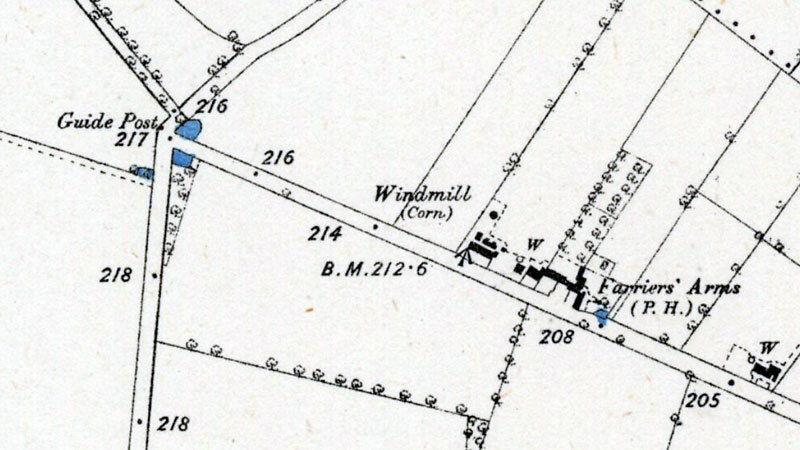 Mr R. V. Ramm said that the man who worked the mill for his father before his father started milling, said that this was one of three clay lump mills in Norfolk, one of which was in Attleborough. He did not know where the mills were in Attleborough. In August 1974, John Kemp, a retired postman of Old Buckenham Green recalled the his father had worked for Harry Smith for 40 years at the postmill and also for Houseago at the towermill, although it is assumed this would have been after the mill had ceased working. William Barber b.1779, my GGG Grandfather was miller at Jay's_Green_Tower_Mill between 1830s - 1851. His son Samuel Barber b.1811 was also at Jay's_Green in 1839, then in 1845 - 1864 he was Miller at Scole_Tower_Mill. His son William Samuel Barber b.1837 was Miller at the following: 1861 - Eye, 1871 - Gissing, 1881 - Rockland All Saints, 1891 - Hingham and between 1878 -1879 William appears to have been at Carlton Rode Tower Mill. William was at Hingham until 1904, his Step-Son Robert John Watling was recorded as miller up to 1908.